I think I finally have my running legs back. Yesterday was warmer and I was tired, so my run didn’t go quite as well as the two previous days. 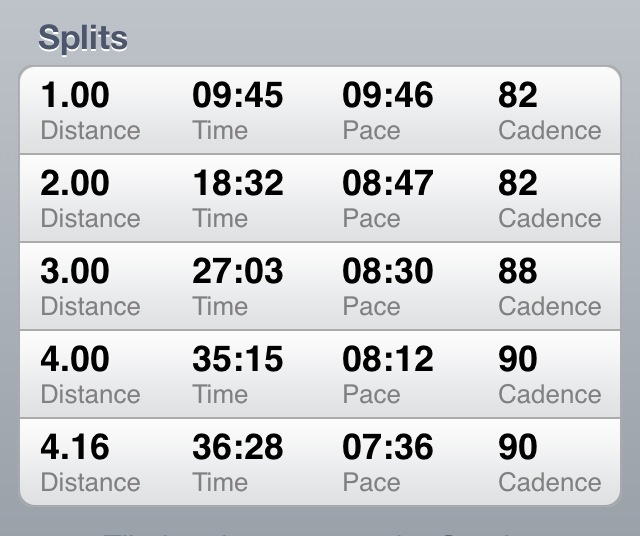 But I am excited to say that I did run negative splits and once again ran 4 miles. For me, 4 miles seems to be the point at which my body loses weight. I have experienced this over and over. I can run 3 miles a day and gain weight. I then up it to 4 miles and I lose weight or at least remain steady. I’m not sure why that is specifically, but I’ll take it. I’ve really enjoyed running lately. I think for me (post marathon) 4 miles is a good amount of running, at least for the next few weeks. It gives me some cardio, but doesn’t feel overwhelming. Funny, when I was only walking last week I had the same mental issues as I did while training for the marathon. Just the thought of doing something for 2 hours puts me into a mental spiral. I thought it was just all the running, but I’m really glad to know it happened while walking. Now I need to train my brain to stop the negative thoughts and to just enjoy what I am doing. That is my goal in running right now. I want to enjoy running again. So all in all things are going in a good direction. I really can’t complain!!! This entry was posted in General run, Running, Walking and tagged health, heat, running, Weight loss. Bookmark the permalink. Yay is right. 🙂 Thanks. I hope yours come back soon too!!! It is interesting looking at your cadence over different speeds. Mine stays much more equal than that, but the difference comes in stride length. That could be part of your foot/Achilles issue. At those lower cadences, your feet may be falling in front of you rather than under. It is interesting that my issues occur more at a slower pace then at faster. You are probably correct. My issue is trying to get warmed up, but once I do I can speed up. Thanks!